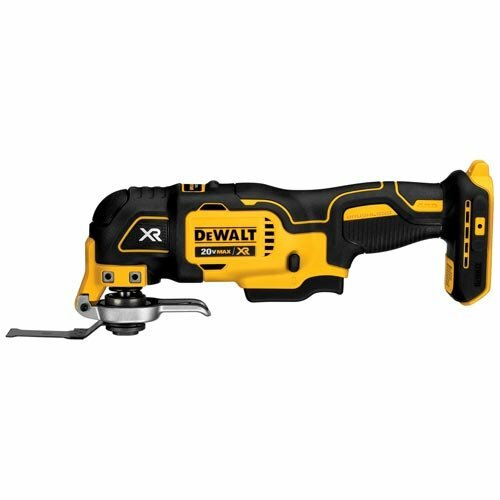 The DEWALT DCS355B 20V MAX XR Oscillating Multi-Tool features a DEWALT brushless motor which delivers up to 57% more run time over brushed. A QUICK-CHANGE accessory system allows blades and attachments to be changed quickly without wrenches, and the DUAL-GRIP variable speed trigger gives users ultimate speed and application control. This tool offers a bright LED light that illuminates dark work surfaces for accurate cutting. It also has an universal accessory adapter for use with most oscillating tool accessory brands. Oscillating angle: 1.6Degree, at 0-20,000 opm (oscillations per minute). Includes: DCS355 20V MAX Oscillating Tool, wood with nails blade, fast-cut wood blade, universal accessory adapter. This is a bare tool item (battery sold separately).